Thru axles, hot dogs and a friendly trade show atmosphere. Last week, we spent a few days in St. Charles, Illinois (about 30 miles west of Chicago) at the 2017 CABDA Expo. We’ll be honest here. Trade shows are a mixed bag. They can be fun and interesting, but also tiring and frustrating. But the CABDA Expo was surprisingly different. Let the record show – the 2017 CABDA Expo was a breath of fresh air and we can’t wait to go back next year. Now, we don’t say this about every trade show, trust me. But the CABDA Expo really was one of the better shows that we have attended. And by the way, CABDA stands for the Chicagoland Area Bicycle Dealers Association. We like that – “Chicagoland” – like its an amusement park. 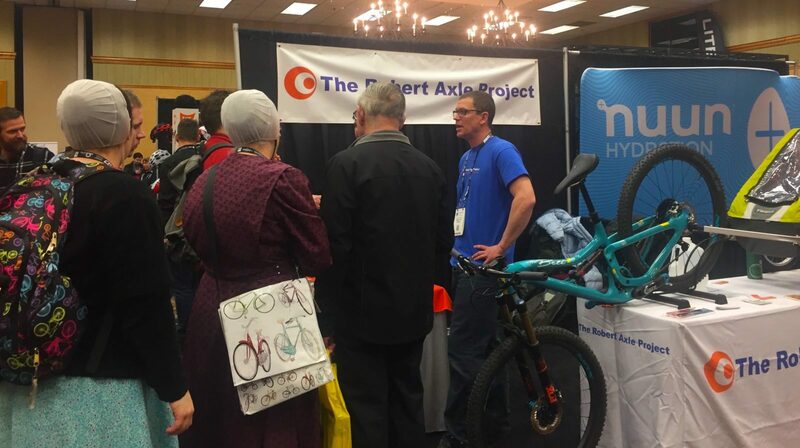 Unlike most of the other prominent bicycle industry trade shows, such as Sea Otter, Interbike and Eurobike, CABDA occurs at a time of year when suppliers and dealers can actually get away from their business or shop to attend the show. It’s pretty tough to get away in April, August and September. But in the case of CABDA, dealers from all over the Midwest can actually close their shop doors for two days to attend the show. And as a small supplier, it is definitely easier for us to step away from business for a handful of days in February rather than in the middle of summer. The dealers that we talked to at our booth were very engaged and very interested in learning about this year’s products. That might have had to do with our display, which involved hot dogs. 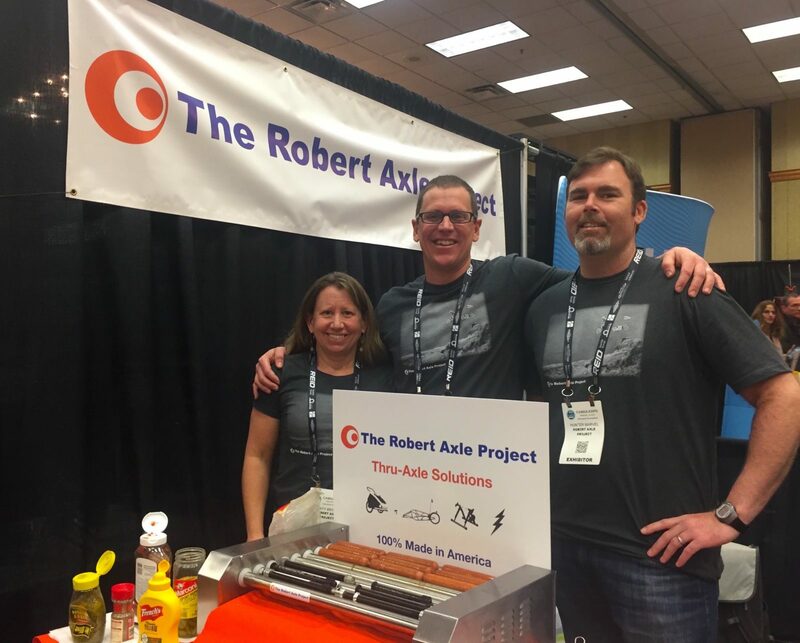 You see, we needed a clever way to display thru-axles and it turns out that a mini-mart style hot dog roller was just the ticket. 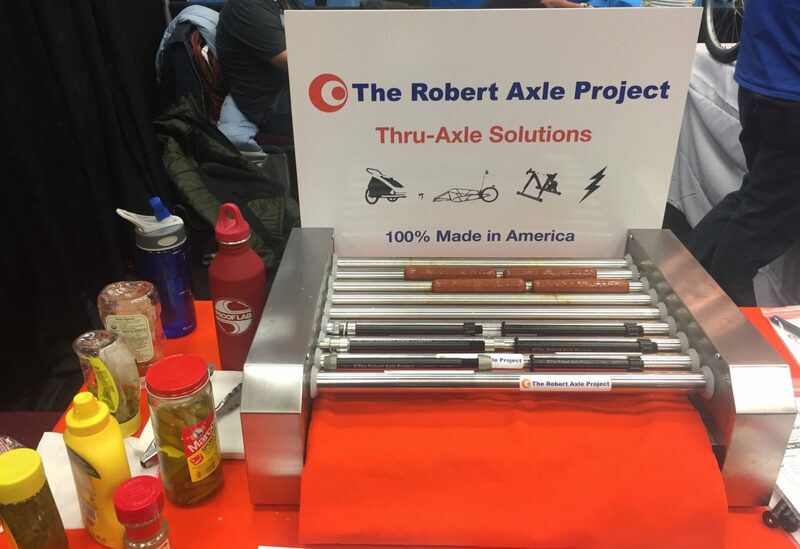 We could display our axles and give away free, Chicago Style Hot Dogs to attendees. While we take our products very seriously, we try to not take ourselves too seriously. In all seriousness, it was wonderful to talk one-on-one with Midwest dealers about all of our products, from our standard Kid Trailer Thru-Axles that allow attachment of trailers to our new Lightning Bolt-On replacement axles. We also garnered a ton of interest in our Trainer Axles. It’s a long cold winter in the Midwest and indoor trainers are one way to keep cyclists from going totally insane! We’re back at it here at the shop, making axles and fulfilling orders, and some of us are craving a slice of Chicago style deep-dish pizza, but we’ll need to wait until next year when we return. 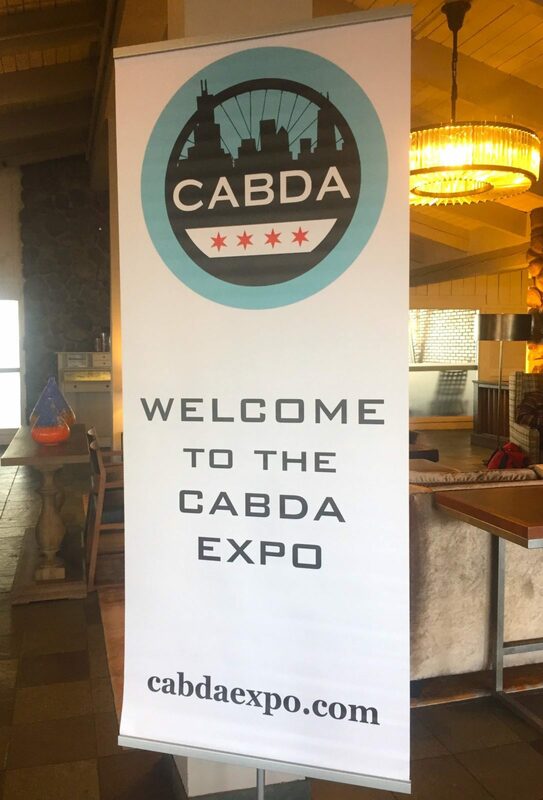 A huge shout out to the CABDA folks, the attendees and the exhibitors for making it a wonderful two-day event! Katy, Chris and Hunter show off some axles and hot dogs. Chris talks to a crowd of enthusiastic bike shop owners. Thank you CABDA and we’ll see you next year! This entry was posted in Robert Axle Project and tagged Burley Trailers, CABDA, Chariot Trailers, Thru-axle, Thule Trailers, trainer. Bookmark the permalink.